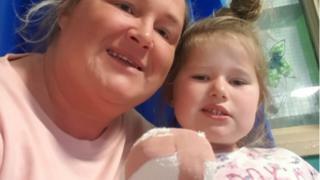 NHS staff have been praised for saving the finger of a five-year-old girl when it was sliced off in an accident. Lexi, five, got it trapped in a door - with her brother J-Mal picking it up just before the family dog got it. She was taken to Newport's Royal Gwent Hospital at 16:00 BST on Sunday and it had been sewn back on five hours later at Swansea's Morriston Hospital. Her mum Kelly Probert-Wilmott praised NHS staff, saying: "They sometimes get a bad press but were brilliant." She described Lexi running outside to play on Sunday afternoon and closing the front door with one hand inside. "She came running in saying her finger had been chopped off," Mrs Probert-Wilmott, of Newport, said. "I couldn't look at it, I had a panic attack. "My 14-year-old thought it was a prank but he managed to pick it up just before the dog got it." The top part of her finger had been severed, with the bone exposed, and Lexi, who was initially crying, went into shock. A neighbour drove them to the Royal Gwent Hospital and staff immediately put the finger in ice. Lexi was then taken to Morriston Hospital, where she went straight into theatre. Her mother described her as "really brave", saying her hand is now like "a boxing glove" as the finger recovers.